Maintenance services including planned or unplanned services are available for Filters, Cyclones, Fans, Rotary Valves, Bearings, Gauges, Duct, Screw Conveyors, Truck loading and unloading systems, Spray Booths, Wood Grinders, Motors, Sheaves, and Bushings. Portable Fan Balancing Service. Replacement Parts for Carolina Blowers and Other Brands Of Material Handling Fans. Associated Metal Works, Inc. are Designers, Consultants and Manufacturers of Dust Collecting Systems that allows air to be exhausted or re-circulated. Dust collecting including, Cyclones, Rotary Valves, Duct (Blow pipe), Fittings, Elbows, Screw Conveyors, Transitions, Fans (Material and Air Flow) Truck loading and unloading systems, Filters, High Pressure Conveying Systems, Electrical Wiring & Controls for your Dust Collection System, Make up Air Units, High Speed Abort Gates, Storage Bin Fabrication, Used Equipment (filters, fans and motors), Laser Cutting & Metal Forming, Repair and even retrofit existing operations! We will survey, and calculate your requirements and design your complete system. Satisfaction Guaranteed. From beginning to end we are the total solution for your project. 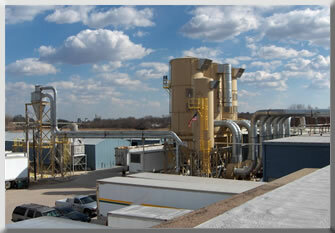 We start in our fabrication department and end up with a completed project like above. So no matter how big or small, location, or need, we can help you with it all. The proof is in the pictures along with our outstanding customer service and technical proficiency. NOTICE: All photos on this site are copyrighted by Associated Metal Works, Inc. These are our photos from work we have accomplished. Please do not use these photos without the express written approval of Associated Metal Works, Inc. Thank You.